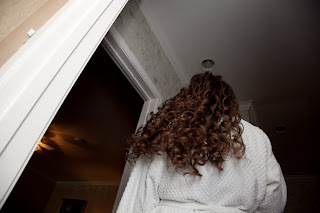 After my head was full of preliminary curls, it was time for all my bridesmaids to get glammed up! Because she would be doing my makeup, Sister Goodlaff was first in the chair. 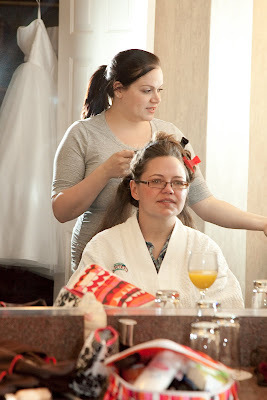 Just like their dresses, I let each girl choose her own hairstyle, and true to form, all of my bridesmaids had completely different hair. 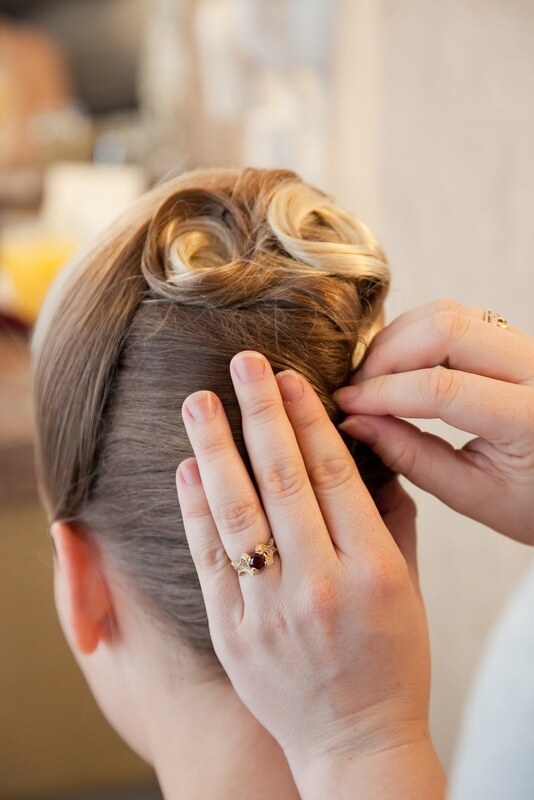 Sister Goodlaff went with a '60's-inspired French Twist, with a few fun curls for a pop, which suited her dress perfectly. 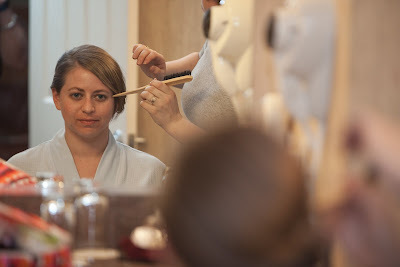 After Sister Goodlaff, it was Bridesmaid Cosmo's turn in the chair. She wanted her hair up, but was unsure if her shoulder length hair would allow for an updo. As you can see, her hair cooperated, and Cosmo ended up with fantastic hair. TCollins decided she'd like to have her hair down, and ended up with curls, curls, curls. 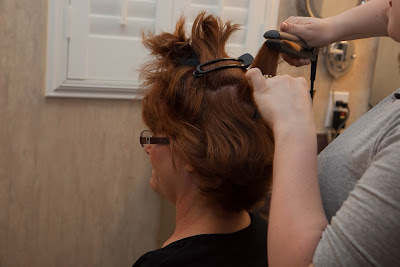 Even Mama Goodlaff got in on the action, and she had her hair done in a half-updo. Lindsay from Styles did such a fantastic job on everyone's hair, and what's more: she was so much fun to have around. 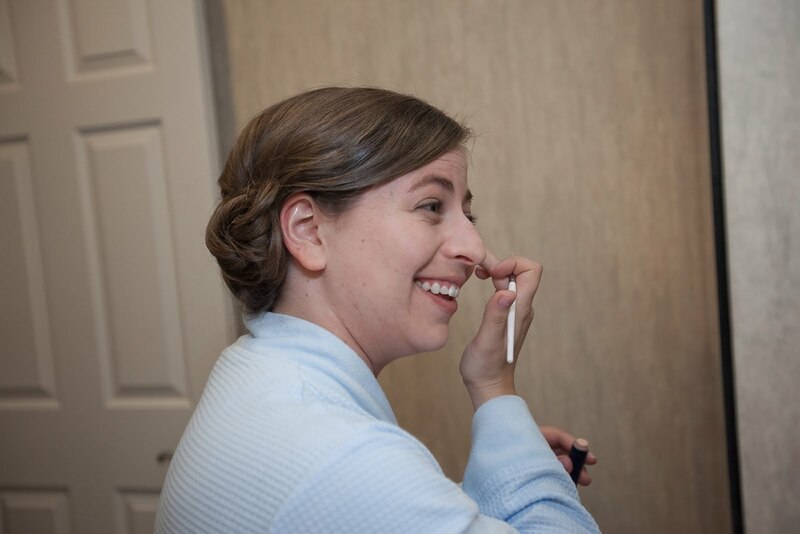 She came to us, with all her tools in hand, and helped us all get beautiful, and I was incredibly glad that we didn't have to go to a salon that morning to prepare for the wedding. 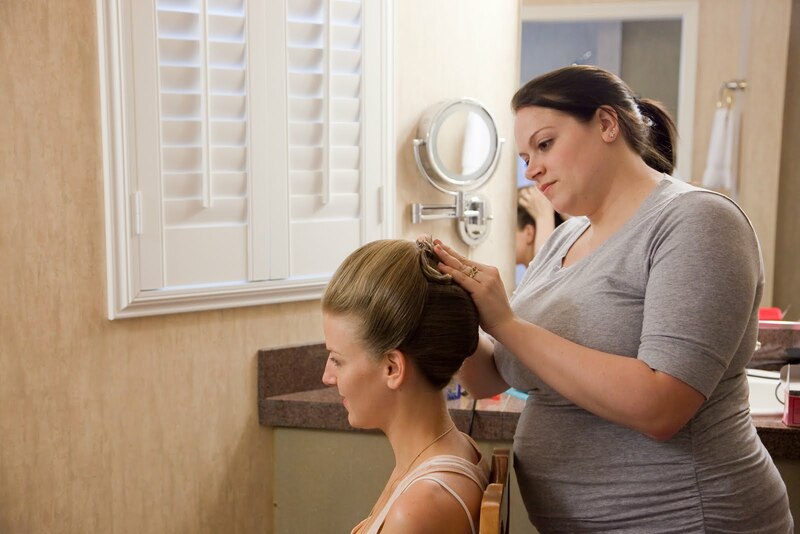 I loved how all of my bridesmaids chose different hairstyles that really fit who they are and the dresses that they chose, and they all looked incredibly gorgeous! 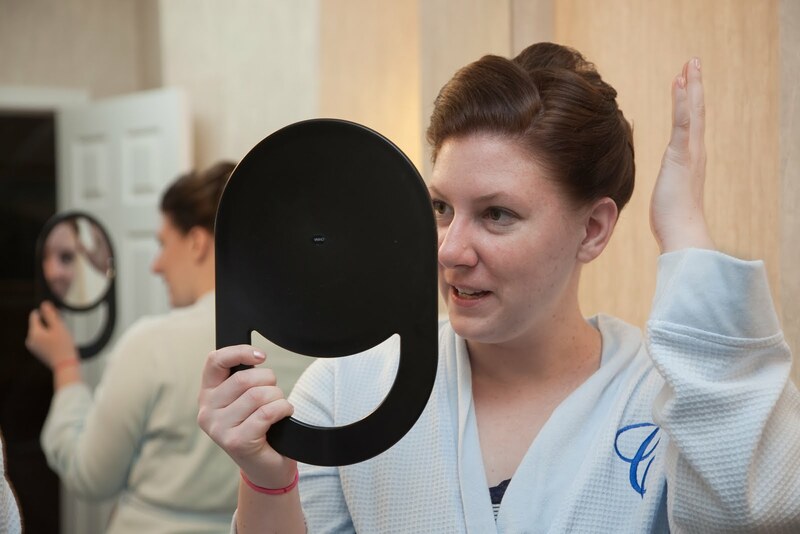 Up next: What's pretty hair without some makeup? 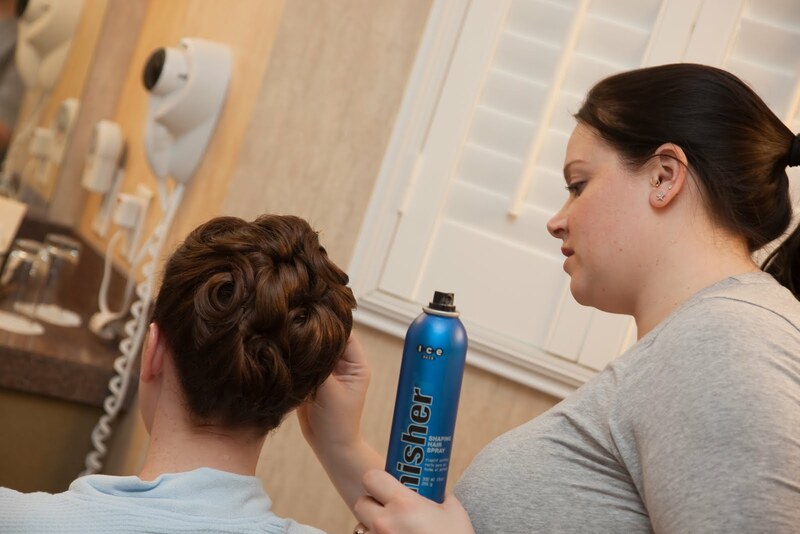 Did you have, or are you planning to have your hair stylist come to you? love all the hairstyles. they all came out great :) also, did you get everyone the robes? i've been thinking about getting them for my girls but they're all so expensive! I did get the robes for the girls as part of their bridesmaid gifts. I found some I liked at Macy's on sale for around $30, and embroidery for each of them cost about $8 a piece at a local embroidery shop. It was pricey, but they and I loved them so much that it was totally worth it!